Painting edges in illustration. Digital Painting Technique, using brushes in Photoshop. Brush is a very essential tool for painting. Without it, there would not be a painting. In traditional oil painting, there are many different kind of brushes for you to pick from. Though the most common brush many painters use are simple round and flat brushes. With just two simple kind of brushes, good painters can achieve an amazing piece without having to have any special fan brush or other texture creating tools. The same principle apply in digital painting. Basically in most painting program (Photoshop CS, Painter series, Gimp, etc. ), we have default round brush soft and hard. And with just these default brushes, we should also be able paint a good piece without having to use any fancy custom brushes. I am not suggesting that we should not use custom brushes. I use a lot of custom brushes in my painting, and I strongly encourage you guys to use them in digital painting. Only one thing, I believe we should be able to paint well with the basic tools first and foremost. Most of all we should understand the core principle of painting such as shapes, values and edges. See "three important rules for paintings" for more detail. What custom brushes do best is creating interesting edges and textures in Photoshop and Gimp. Sometimes it mimics the look of the oil painting with beautiful strokes and textures. Anyway, I just lost my train of thought. I just remember that I just want to talk about "edges" in this post. Any brushes, no matter how awesome it looks, will not be much use if we do not understand edges. In painting, digital or traditional, we use edges to bring out an image from the empty canvas. Painting with great use of edges often look really powerful. I would love it if I can be better at applying edges in my own painting. It takes me years to try to understand edges. To me, the concept is very abstract and often difficult to apply and master. 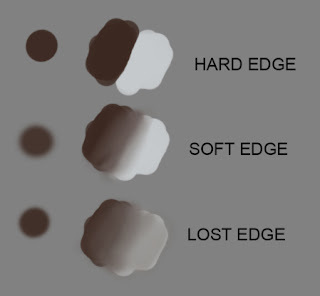 There are three type of edges; hard edge, soft edge and lost edge. We can achieve these edges using just default brushes (soft and hard). Hard round brush can easily create a really strong hard edge. And soft round brush is perfect for soft edge and lost edge. Below are the sample of edges in digital painting. *In some case value range, color range, softness and hardness could fall in between. Here is the image I've been working on, still very rough. But it can still roughly demonstrate edges. I'm an aspiring Digital Painter, I'm just beginning to study it in fact, but I want you to know that your work really inspired me to join this career. You see, I'm a die hard Guild Wars fan and I always thought GW and GW2 artwork is among the best in the whole gaming industry. Too bad you're not there anymore, I know you'll be missed. Since I'm just beginning I have a quick question for you. I'm struggling to train my hands to be more firm and draw more precise lines. Is there a technic or any tips you could give me? I also love all your guides, but I feel they're too advanced for me right now. Is there any of them that you say a beginner should be able to do reasonably well? Or just try them all, no matter the outcome, but keep trying to improve? Ok too manh questions, sorry. The last one is a fan question: Of all your wokr on GW and GW2 team, wich piece of art is your favorite? Could you show or link it to us? Last but not least, I want to thank you so much for sharing your knowledge. You're really gifted, please never stop painting. Hey Xia what happened to that tutorial about female dynamic poses?? I am having problems with dynamic poses what do you recommend?? By the way your male muscle tutorial has helped me a lot. and the female one as well. Hey Xia what happened to that female Dynamic poses tutorial?? Im having problems drawing characters in different poses. Btw I love your female and male drawing tutorial. @Segujo Thanks, now it is up. Newest post today. @Danieal Ed You are welcome, thanks for stopping by, hope you get something useful from here.